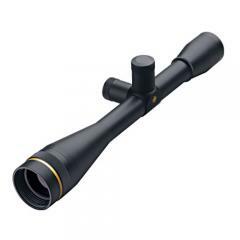 Leupold 66860, 66855 FX-3 30x40mm Adjustable Objective Silhouette Riflescope FREE SHIPPING! The Leupold FX-3 30x40mm Adjustable Objective Silhouette Riflescope is a premium fixed power optical system for those who demand the highest performance from their equipment. It features precision-engineered multi-coated optics that deliver exceptional image clarity, with Xtended Twilight Lens System technology that maximizes low-light frequencies. The blackened lens edges minimize light diffusion for improved brightness. The scope features an LR Duplex reticle that aids in range estimation for more accurate shooting, as well as finely adjustable windage and elevation controls for pinpoint accuracy. The rugged tube is completely waterproof for all-weather shooting, and the lens glass is treated with an almost completely scratchproof DiamondCoat 2 coating. The eyepiece is internally threaded and comes with an Alumina rubber guard for protection. ©2002-2019 CopsPlus.com: Leupold 66860, 66855 FX-3 30x40mm Adjustable Objective Silhouette Riflescope FREE SHIPPING!